Smartly priced at $398,000 in Palm Desert’s Brava community! Statistically speaking, we are in a neutral market in the Coachella Valley since our inventory has dropped to about a 5-month supply overall. However, statistics fail to consider the seasonal market we live in and the reduced inventory of the summer (approximately 3,800 units compared to 5,200 units just three months ago). As a local real estate expert, I have observed that home values are still being strongly influenced by Buyers in combination with these seasonal and inventory fluctuations. Should inventory remain low as the season begins, then Sellers may be in a better position as demand and supply more closely match. The Average Days on Market for Coachella Valley homes continue to be three digits – 114 on average with home priced above the million-dollar mark averaging higher. 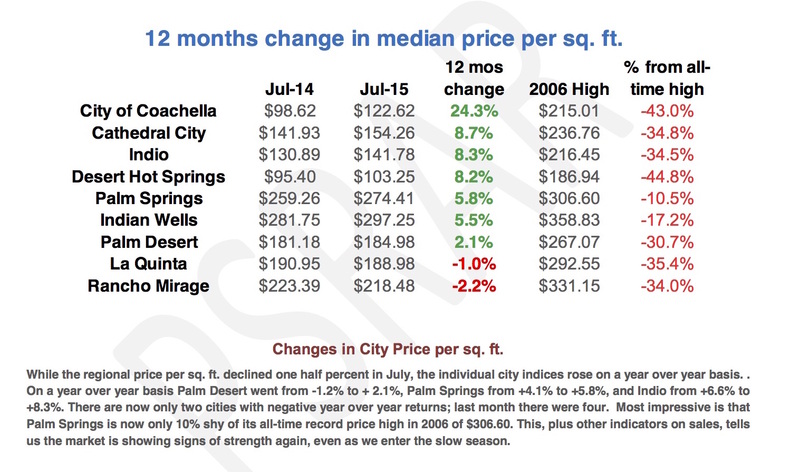 As noted in the most recent market numbers from the Palm Springs Regional Association of Realtors (PSRAR), our prices continue to be off the market highs but reflect positive growth. Coachella Valley real estate continues to be an attractive value to Buyers and opportunity for Investors. Sellers serious about moving their properties should note the continued importance of bringing listings onto market priced well so that the home takes advantage of the 30-day honeymoon period all properties enjoy when entering the market. Non-competitively priced homes suffer from lack of interest the longer they stay on market.